Opihi rainbow trout, possible searun rainbow? This topic contains 6 replies, has 1 voice, and was last updated by troutfishernz 5 years, 2 months ago. Caught this 2.5lb rainbow about 2km up from the opihi mouth this afternoon. 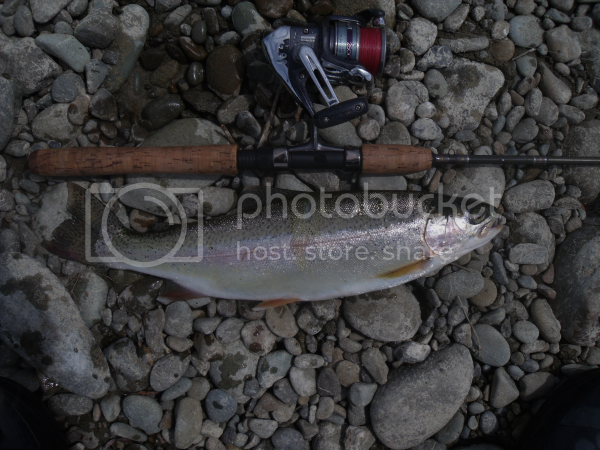 First ive ever heard of Rainbow trout in the Opihi and ive never caught one in the tidal/brackish water before. fought like a 5lb brown trout. after the earthquakes 40,000 rainbows escaped from Montrose into the lower Rakaia, f&g have released more since in the hope of starting a steelhead fishery. rainbows are being caught in the Rakaia lagoon and one that weighed 11.5lb was definitely searun some are now in the 5lb range. so it is possible that the fish has come from the Rakaia and that is good news let f&g know. rainbow have been caught in the avon heathcote and ashley this year and a 7lb one in the lower waimak. interesting Burkefish, rang fish and game yesterday and they reckon the odd one comes in from the sea but there is also a very small resident population as there is rainbow trout in the Opuha river so before the dam they could have easily gone down to the Opihi. Brown trout are caught at sea from fishing boats occasionally. I have caught sea-run browns from the beach while spinning for kahawai far from any river-mouth. I guess rainbow trout would have to be caught in the sea proper to be called true migratory steelheads? Rainbows were often caught in the Waimakariri River just downstream from the bridges in mid-winter. Several old blokes I know used to catch them on shrimps before that was outlawed. that’s interesting as that would be getting around the time that any searun rainbows would be on the move for their spawning run. have over the years caught 1or2 rainbows around the kaiapoi mouth during the salmon season and can recall catching the odd one in the south branch in 60’s and 70’s. might have to target them down there this winter.